"It was a cold and windy night"...... Really! That being said, we had 20+ Pickleball players on the courts and several spouses taking to the courts from the sidelines. Next week I think we will have several new players! The Morneau men gave everyone a tough match and Ke Kai Ruckstuhl came from Tennessee with an assortment of new and unique paddles for everyone to purchase. 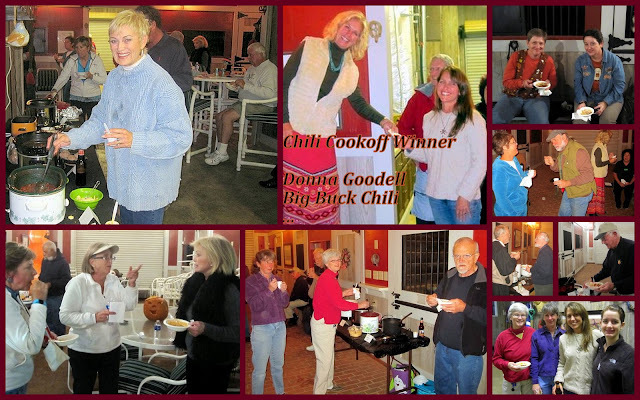 After 2.5 hours of Pickleball, everyone warmed up in the heated stable with 17 pots of chili for the North Georgia Chili Cook-Off. With the following chili entries:Ruxes M meatless Chili (Ke Kai Ruckstuhl), Big Buck Chili (Donna & Greg Goodall), Chili Weather (Gabriele Miller), Willie's Chili (Bill & Dena Whatley), Chillicious Chili (Floyd Moody), Mom's Recipe Chili (Ken & Janice Riordon), Leggero Chili ( Dottie & Jim Frassetto), Kitchen Kickin Chili (Kathy Brown), Frankly My Dear (Tony & Debbie Franks), Hot Chic Chili (Cheryl & Bruce Kosin), North Meets South Chili (Jamie McDaniel & TC), Savanna St. Chili (Elizabeth Kelly), Chili O Chili (Regina & Don Lucas), Sit in the Creek Chili (Pat Denman), Chili Pavo (Jon Pyle), and Oktoberfest Chili (Sabine & Fabio Yeppes). The $50.00 grand prize winner was "Big Buck Chili" by Donna Goodall. Other contributors were Mark Morneau with chips, Judy Vonesh with soft drinks, water, and beer, and Chuck & Linda Fahn with cornbread. Kathy Brown exhibited a small art show in the piano studio, everyone enjoyed tasting and eating, and today despite the cold temperature and gusty wind, there will be players back on the courts at 10 a.m. for more Pickleball! Thanks to all who came and participated! Brrrrr - back to the fireplace!